“Tuesdays with Morrie” is the autobiographical story of Mitch Albom, an accomplished journalist driven solely by his career, and Morrie Schwartz, his former college professor. Sixteen years after graduation, Mitch happens to catch Morrie’s appearance on a television news program and learns that his old professor is battling Lou Gehrig’s Disease. Mitch is reunited with Morrie, and what starts as a simple visit turns into a weekly pilgrimage and a last class in the meaning of life. Appearing in this production of “Tuesdays with Morrie” are Jeff Leinbach and Dave Hurlbert. Gettysburg Stage is holding auditions for Egad, The Woman in White, a melodrama by Tim Kelly. This laugh oriented, old fashioned melodrama is based on Wilkie Collins’ classic and it’s wild, fast and funny. It features a disreputable (and hilarious) villain who dispatches his adversaries with nefarious ease and even seals his wife in a madhouse to steal her vast fortune! He battles a wicked countess in one of the most uproarious fight scenes ever staged! When all else fails, he engineers mock funerals. But he’s scared of the mysterious “woman in white” who’s escaped from the asylum to seek him out. Abandoned wives, insolent servants, lawyers, hypochondriacs and manly drawing masters parade across the stage in gales of comedy terminating only when the villain is brought to justice in an audience cheering, outrageous and spectacular finale. Designed for an easy rehearsal schedule and simple production, this delight is suitable for all groups looking for a play that’s fun to perform. The cast consists of 3 men and 7 woman of varying ages. The audition will consist of cold readings from the script. Auditions will be held on Wednesday and Thursday, April 23 and 24 at the Local 1776 Union Hall on 3161 Chambersburg Rd. (Route 30) at 7pm. Gettysburg Stage’s production of Mrs. Bob Cratchit’s Wild Christmas Binge is an outrageous musical parody of Charles Dickens’ beloved Christmas classic, A Christmas Carol. Written by acclaimed humorist Christopher Durang and directed by Hilary Snesrud, Mrs. Bob is a hilarious lampoon of a familiar tale. Clearly suffering from a “kind of seasonal Tourette’s Syndrome,” Ebenezer Scrooge is led by a sassy Ghost of Christmas Past though his past, present and future in order to change him – or at least that’s the idea. With her magic malfunctioning, Scrooge and The Ghost continually find themselves transported to the wrong place and time. She and Scrooge keep appearing in the present at the pathetic home of his pathetic employee, Bob Cratchit. Mrs. Bob Cratchit, a minor character in Dickens, takes center stage here. No longer loving and long suffering, Mrs. Bob is in a rage: she’s sick to death of Tiny Tim (the goody-goody crippled child), she hates her twenty other children (most of them confined to the root cellar), and she wants to get drunk and jump off London Bridge. As the Ghost loses more control, the plot morphs into parodies of Oliver Twist, The Gift of the Magi and It’s a Wonderful Life. And to make matters worse, Scrooge and Mrs. Bob seem to be kindred souls falling in love. With a climax that is two parts Touched by an Angel and one part Wall Street, Scrooge’s tale of redemption and gentle grace is placed squarely on its head. Set in an isolated cottage in the west of Ireland, “The Beauty Queen of Leenane” tells the darkly comic tale of Maureen Folan, a plain and lonely woman in her early forties, and Mag, her manipulative aging mother, whose interference in Maureen’s first and possibly last chance of finding a loving relationship sets in motion a train of events that leads inexorably towards the play’s terrifying conclusion. “The Beauty Queen of Leenane” is a tragically dark comedy written by acclaimed Irish filmmaker and playwright Martin McDonagh, and directed by Pamela Hurlbert. Appearing in this production by Gettysburg Stage are Jeff Leinbach, Rebecca O’Leary, Buff Wills and Chris Bratton. Auditions for “Improv” and another one act will be held Monday, May 6 and Tuesday, May 7 from 7 pm to 8:30pm at the UFCW Union building, 3161 Chambersburg Road, approx. 7 miles west of Gettysburg. All interested should attend for a cold reading of script pieces. It’s 24 hours before Christmas, and all hell is about to break loose in Tuna, the third smallest town in Texas – where the Lion’s Club is too liberal and Patsy Cline never died! This year, in addition to the usual holiday headaches, a mysterious “phantom” has been vandalizing the Christmas displays in the town’s annual yard-decorating contest, and a disaster prone production of “A Christmas Carol” is falling apart. “A Tuna Christmas” is an uproarious comedy written by Jaston Williams, Joe Sears and Ed Howard, and originally produced by Charles H Duggan. Gettysburg Stage’s production is directed by Rebecca O’Leary, and reprising their role as all 24 characters are comedic duo Jeb Beard and Ryyn Currey. 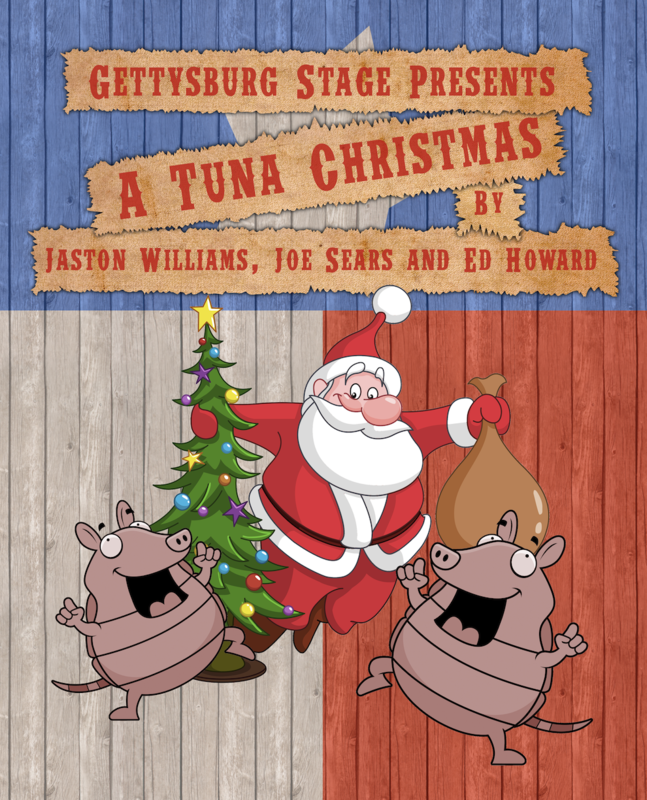 Performances of “A Tuna Christmas” are at the GAR Building at 53 E Middle St, Gettysburg at 8pm on December 7th, 8th, 14th and 15th. 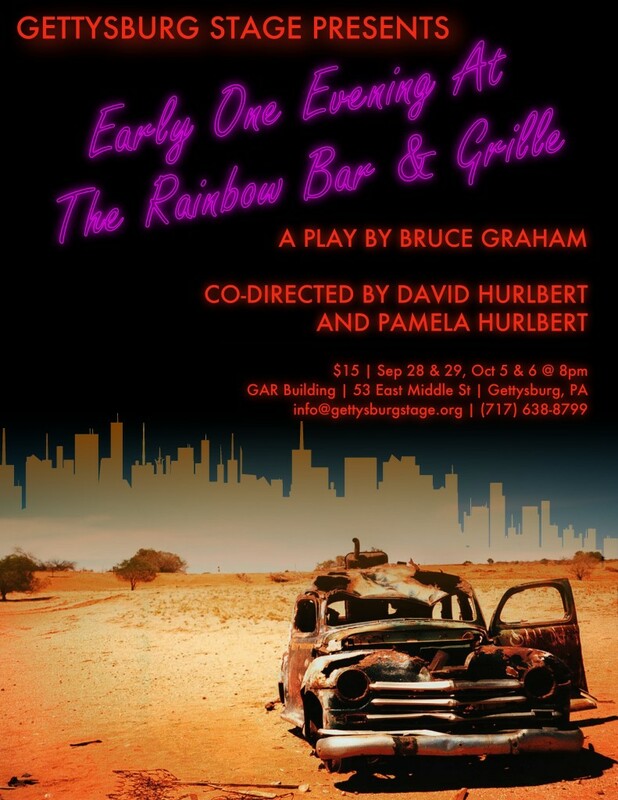 To request reservations, or for group bookings, please email info@gettysburgstage.org or phone (717) 638-8799. General admission is $15, and $12 for students, seniors and military personnel. 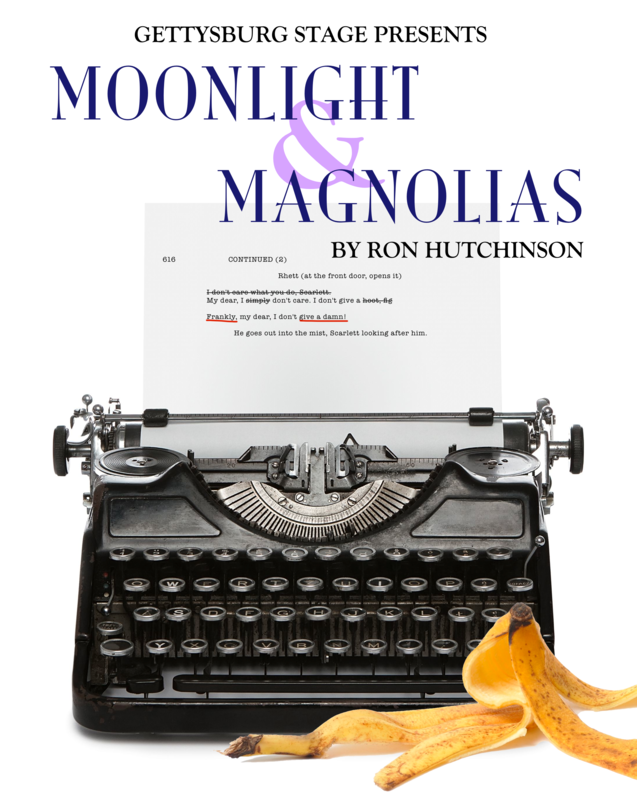 Gettysburg Stage will be holding auditions for our spring production, the comedy “Moonlight and Magnolias” on Tuesday, February 5th. Auditions are from 7 – 8pm at Tipton’s Grill, 135 Baltimore Street, Gettysburg. We are seeking three men and one woman in their mid-twenties or older. 1939 Hollywood is abuzz. Legendary producer David O. Selznick has shut down production of his new epic, Gone with the Wind, a film adaptation of Margaret Mitchell’s novel. The screenplay, you see, just doesn’t work. So what’s an all-powerful movie mogul to do? While fending off the film’s stars, gossip columnists and his own father-in-law, Selznick sends a car for famed screenwriter Ben Hecht and pulls formidable director Victor Fleming from the set of The Wizard of Oz. Summoning both to his office, he locks the doors, closes the shades, and on a diet of bananas and peanuts, the three men labor over five days to fashion a screenplay that will become the blueprint for one of the most successful and beloved films of all time. When a mysterious disease begins to claim the lives of billions of people, a group of working-class patrons gather at their local watering hole to decide how best to tackle this nuisance. Salvation comes in the form of a travelling salesman, who claims to be God and offers the bartender immortality if he will write a new Bible … and get it right this time! 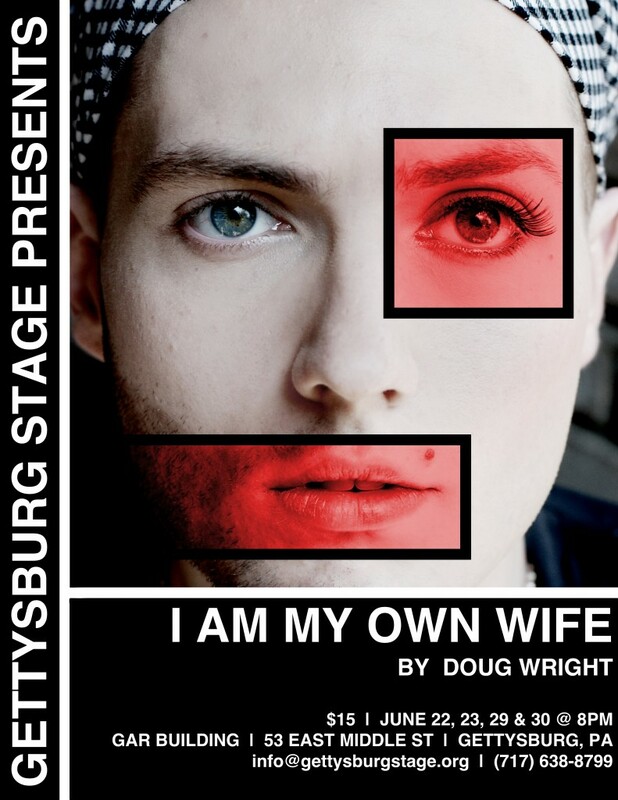 Based on a true story, and inspired by interviews conducted by the playwright over several years, I Am My Own Wife tells the fascinating tale of Charlotte von Mahlsdorf. Born in Berlin as a biological male named Lothar Berfelde, Charlotte corrected what she considered to be a mistake of nature at the age of 15 and adopted female dress and deportment. Despite the risks involved, she openly flouted rigid gender norms by dressing as a woman under two of the most repressive totalitarian regimes in history: Nazi Germany and the Communist East Germany.